Platformer, in which we play the role of a heroine traversing the fantastic world. The main attraction of The King's Bird is the ability to glide - in this way we not only instantly move between distant places, but also bypass numerous traps. 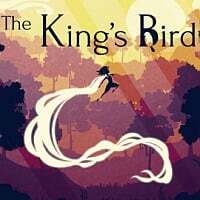 The King's Bird is a platform game developed by an independent studio called Serenity Forge. Apart from creating games, the team also operates in the publishing field, although the production described here was published by Graffiti Games. The King's Bird takes us on a journey to a fantastic world under the rule of a tyrant. We play as a heroine who travels through this land, trying to regain the lost freedom. The story told in the game is full of understatement, which is compounded by the fact that it is conveyed without the use of words. In The King's Bird the action was shown from the side perspective. The game consists of five vast levels, the appearance of which are inspired by the works of ancient civilizations - players will find elements from ancient Rome, accents from Southeast Asia, and or even references to Mayan cultural works. During the game, players jump between platforms, avoid numerous traps (e.g. in the form of poisonous gas), bounce back from vertical surfaces, and above all - glide in accordance with the laws of physics, thus gaining speed when desceding and slowing down when ascending. The game features a high difficulty level, thus dexterity, perceptiveness, and precision are often required. It is worth noting that there are optional challenges awaiting players in the form of beating time records of a given stage or searching for meticulously hidden finds. The King's Bird features 2D visuals kept in an unusual style - it is colorful and includes detailed level contrast with characters that look like shadows. The unique atmosphere is also created by atmospheric music accompanying the party.